A documentary on Leonard Bernstein, a passionate musical genius, could cover an examination of his politics, social life, psychology, family and music career. But to do justice to any of these aspects would mean at least a five-hour film. So this one-hour doc focuses on just one aspect, his music career – and this is wild enough. This year’s 2019 Seattle Jewish Film Festival opened with “Leonard Bernstein: Larger Than Life” and a focus on music. Each year the SJFF features food, interactions, films, and a variety of entertainment and presentations related to local, national and international Jewish life. This year live music and jazz from Blue Note Records was also featured. 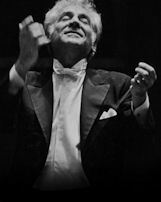 Bernstein appears to channel each composer as if he were involved in the same struggle, as he directs his musicians with physical, dramatic, and emotional passion. At the end of each performance, his face gushing sweat, his personal assistant has a scotch and cigarette ready for each curtain call – and more of the same available in his dressing room. What is most impressive about Bernstein was his love of people. He could only compose as a team member because he was so socially dependent. The “Romeo and Juliet” inspired “West Side Story,” his masterpiece, was written with Jerome Robbins and Stephen Sondheim. His songs, the delicate, loving “Maria” and ground-breaking, jazzy “Cool” are classics. One daughter explains, “He kissed everybody. He kissed presidents and first ladies. He was a kissing bandit. He didn’t have a sense of distance.” A close friend reports that Bernstein wanted to be loved by everyone. When someone retorted that would be impossible, Bernstein lamented that that was the tragedy of his life. Bernstein headed up music festivals around the world and was involved in instructional workshops for up-and-coming directors. At one point he is in Berlin, where one of his favorite composers, Gustav Mahler, had been banned. He insists on resurrecting the composer to the reticent German musicians. He explains how he had to lose his temper to get them to release their inhibitions. “Leonard Bernstein: Larger Than Life” is an inspiring film about a devotion to music and a love of people by America’s best conductor. It resurrects what it means to have a passion about life, people and the arts. To see him in action is to witness the essence and wonder of being. ← Battle of the Spies: Who’s the True King?